? It spurs your creativity and lets you test different types of content link bait (without the need to create new content and conduct any additional research). This post looks at one type of content re-packaging: turning your old content into an image (and thus allowing it for download and easier spreading). Create a few drafts and the idea will arrive! Get inspired: Here’s a great collection of flowchart-based infographics. Find the best free tool: You can use this tool as a decent flowchart generator. This one is paid, but it’s free to try. Alternatively, you can just use a pen and paper (or a whiteboard) which (for me) somehow frees the creativity. 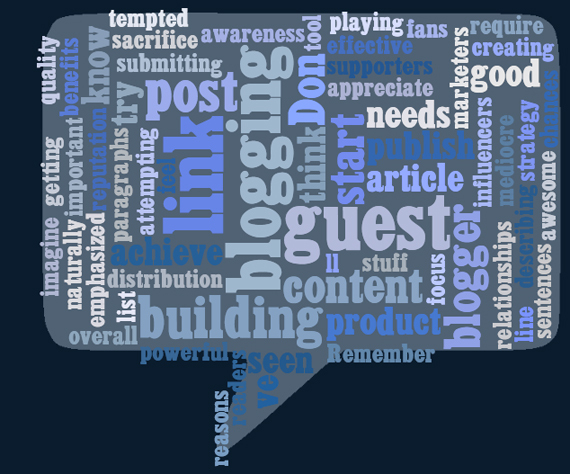 It’s been always hard to prompt our MyBlogGuest members to follow the rules on creating and formatting a guest post. 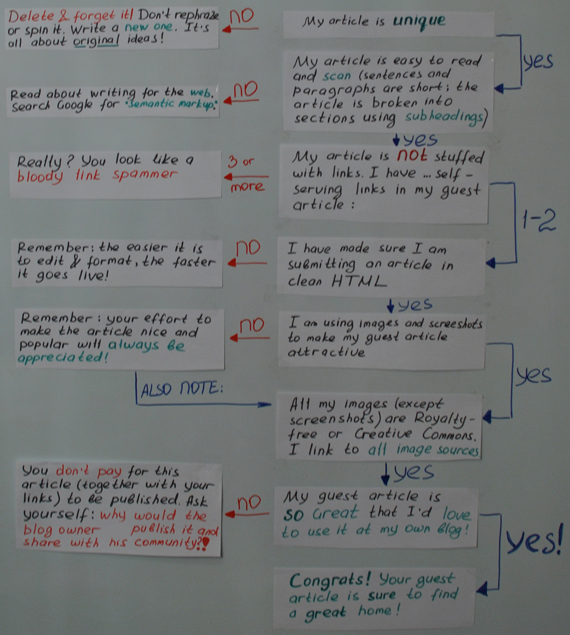 So I created a checklist to help them, and then later visualized the guest article quality check process using the flow chart on my whiteboard. If you write a lot of guest posts, that’s something you should do as well! You probably know I love comparison charts. I frequently make them and the feedback is always that they make the content much easier to digest and remember. So if you want to create a downloadable freebie to please your readers, here’s a great idea: throw your product review in a table, turn it into a .jpeg image and share it. 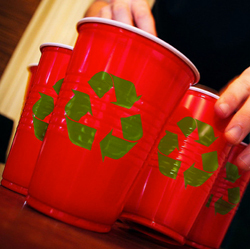 If your content is useful, if doesn’t have to be well-designed! Get inspired: Here’s one comparing popular models of cameras. Here’s another good example that compares apples to oranges (in both cases, scroll down a bit to the actual table). Find the best free tool: Any HTML editor you are using that can insert and customize tables. 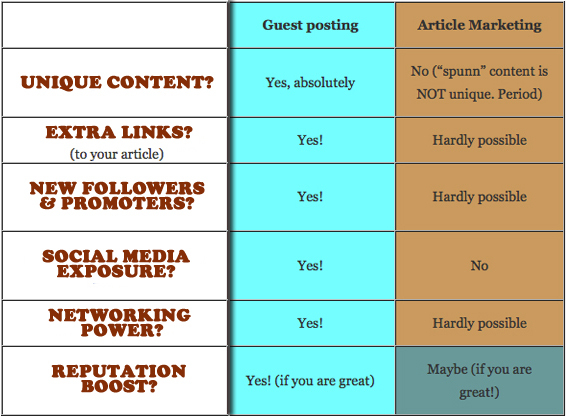 Do you want to train your team to remember the difference between article marketing and guest blogging, let them save this table, print it and use for reference. Like a flowchart, a mind map is a great way to visualize the information structure, but while a flowchart is better for explaining the process, a mind map is perfect for structuring any content. Get inspired: Here’s a great collection of mind-map-based infographics. Find the best free tool: Here’s my old post that lists some tools and tips on mind-mapping (but as you’ll see from the comments, the preferred way is still to use pen and paper!). If you can come up with a cool idea, just use What Do You Suggest which is based on Google Suggestions. While all the 4 four ideas above are perfect for better explaining what you meant to say, this one is purely for fun. But fun is a great content marketing tool as well! Find the best free tool: Both of these are totally awesome: Wordle and Tagxedo. Any more ideas here? Please share them in the comments! We’ve been doing this recently, and we’re also getting a lot of good links by submitting these kinds of images on image hosting/sharing sites. Works pretty well on diversifying links and getting referred traffic as well. Ann as always i get some new fresh ideas for my site promotion and this time it was not different too. As Jason also has suggested that its working pretty well for him, i would surely going to do this. Thanks for sharing. The word-graph is always useful to get a series bounce rate while your readers try to nudersand the whole graph, I have added some of them to my posts, sure made my Google rank go up due to low bounce rate, of course while adding qualty and interesting content. 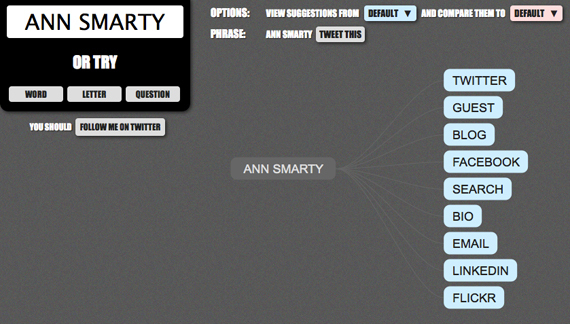 Interesting ideas, Ann. Now that I’m starting to have a lot of content repackaging some of it sounds appealing. The idea is definitely interesting. However, this in my opinion is even harder than writing original content. 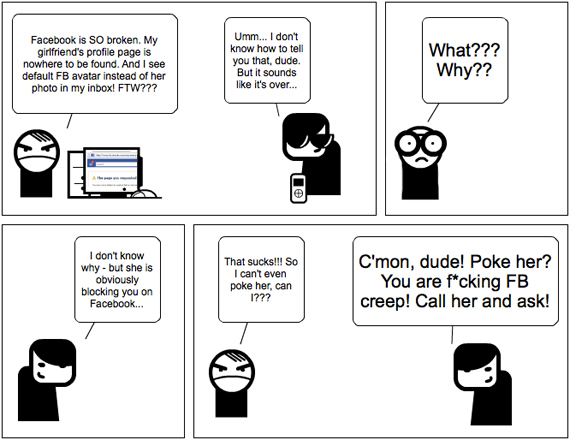 And moreover, after the Panda update, I don’t know how well this will go down with the search engines. But definitely a very interesting concept. Your tips are very engaging. Comics can be very effective when explaining a concept. They can be used to inform and to entertain. When using them, I suggest using easy-to-relate-to characters. They can make our message more understandable. Love the comparison idea. I can think of a ton of those that will fit well into my posts. All great (and useful) ideas! I love this post Ann. I have been a huge fan of yours for years and of course I’m a member of MyBlogGuest.com as well. Nice work ann. It really help me for my website designs.